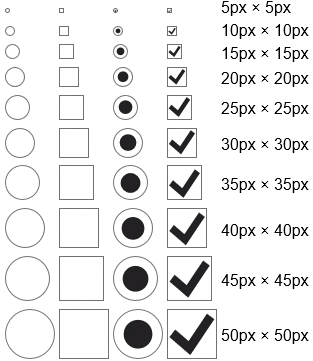 Starting with firefox-3.0, checkbox sizes (and possibly other style properties) can no longer be adjusted using the "height" and "width" CSS properties. This is something that has worked all right in both firefox-1.5.x and firefox-2.0.0.x. Looks like a native theming regression. We do reserve the right amount of space, but don't paint at the right size. That's likely to be an issue on all operating systems, once bug 446646 and bug 446647 are fixed, but moving to Windows widget for now; we might need separate bugs on the other widget sets. I would say we should either drop native theming on resize or scale the themed image or something. I can confirm this bug for i686 Linux builds, too. Actually, the Linux behavior is quite different from Windows and is covered by bug 446646. When I press Ctrl++ or Ctrl+- every part of a page is resized but the checkboxes stay as is. Is this related to this bug or even the same? What about Bug 439499? Is that bug also related to this one? > Is this related to this bug or even the same? Not really, no. That's a coordinate system issue, and it's been filed for a while. > What about Bug 439499? That's a duplicate of this one. Just to note, this works fine on OS X.
Firefox on Windows is the sole browser on Windows 10 that I tested that still doesn’t let you resize checkboxes/radios. Everyone else either users the vector system widgets (IE, Edge), what appear to be built-in but still vector widgets (Chrome) or if you’re Opera Windows Classic widgets(?!). It’d be lovely if Firefox could fix this regression. At the moment our alternative is to hand-roll custom radios / checkboxes with all of the difficulty of maintenance that brings. We are deploying Microsoft's Project Online within our org (hundreds of users) and the timesheet has checkboxes that do not resize in Firefox when employing Ctrl+/-. For onscreen space management purposes, users will be foreced to not use Firefox if this is not fixed anytime soon. This can be replicated 100% of the time and works in all other tested browsers. The ctrl+/- behavior is not this bug. See comment 6. Can anyone still reproduce this? It works for me in the oldest Nightly build supported by mozregression-gui. Bug 1476454, comment 2 says the issue is reproducible in Windows 10, but it's not for me. > Can anyone still reproduce this? I can still reproduce this in the current Nightly (63.0a1 (2018-07-18)). 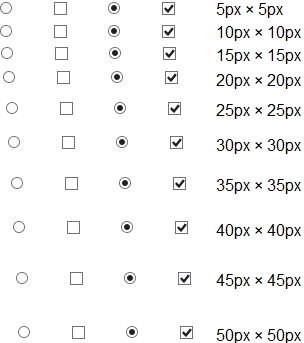 If you take the URL that this issue, the data-uri and paste it into a new tab, then you can see the issue: The checkbox and radiobox are both at the same small size even though they both received a width and height of 100px. 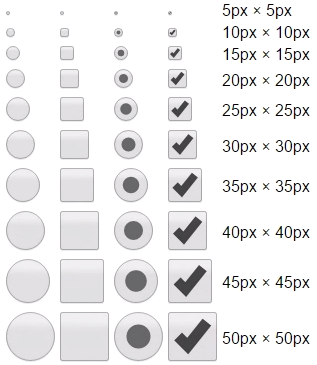 The click area for both is exactly that size but they are not rendered at that size. 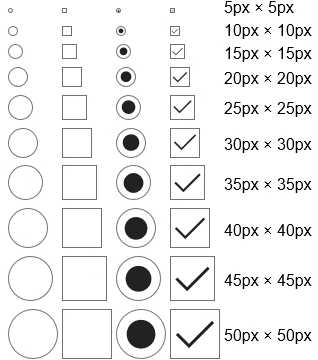 Similarly, if you scale the site using Ctrl+/-, you visibly scale that 100px up or down but the drawn checkbox and radiobox stays the same size. 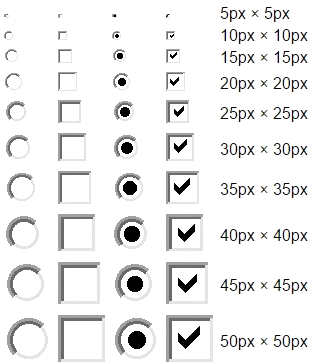 Compare that to other browsers (Chrome, Edge, IE), where the checkbox and radiobox are actually drawn at that 100x100 px. > I can still reproduce this in the current Nightly (63.0a1 (2018-07-18)). > same small size even though they both received a width and height of 100px. Screenshot from a brand new profile. > Screenshot from a brand new profile. My side, also a brand new profile. Also checked on Windows 8.1 with a 32-bit Nightly, and I get the same result there. The difference is the DPI setting (Settings -> Display -> Scale and layout). I can reproduce the issue with the default 100%, while even 101% is enough to produce controls approaching the size of the previously posted screenshot. I don't think it is Windows specific. Linux is tracked in bug 1476454. They're separate problems that need to be fixed separately.